Ah, Nostalgia. Is there any power stronger? It kept VH1 on the air, it provides film studios with a way to make a quick buck when they run out of ideas, and it has helped indie game developers get around the high cost of AAA visuals. 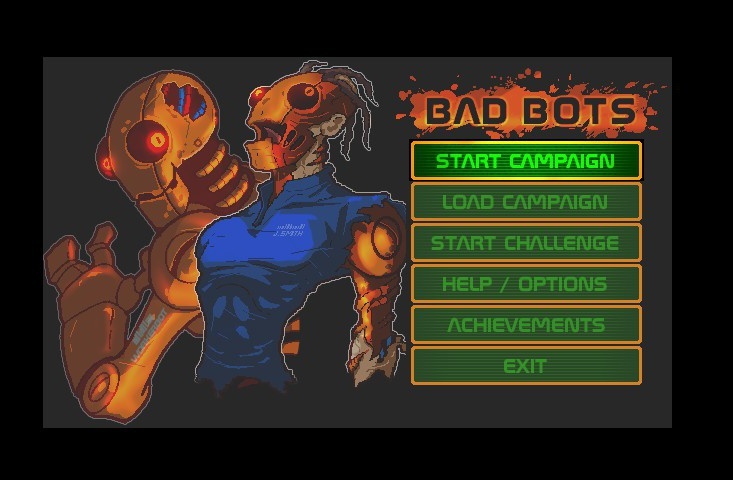 Case in point, Bad Bots, a game by Digital Tribe Games that take full advantage of the power of nostalgia to deliver some old-school fun. As my little nostalgia rant would indicate, Bad Bots took the retro route with its visuals. The graphics are definitely old-school, but exactly how old is a little tricky to classify. It ha’s the color palette of a late cycle SNES game, but the resolution and clarity of the graphics take it further into the following generation. Remember when systems from the Playstation 1 era would periodically take a break from polygons and give some really high quality sprites a chance? This falls roughly into that category. It looks better than the games I played growing up, but still evokes the simple honesty of the pixel. One thing that I really enjoyed about the visuals was the fact that just because we are going for the look of games from decades past doesn’t mean we have to ignore all of this horsepower computers have accumulated. That means that the game isn’t shy about throwing legions of enemies at you without pesky things like slowdown or flicker becoming a problem. 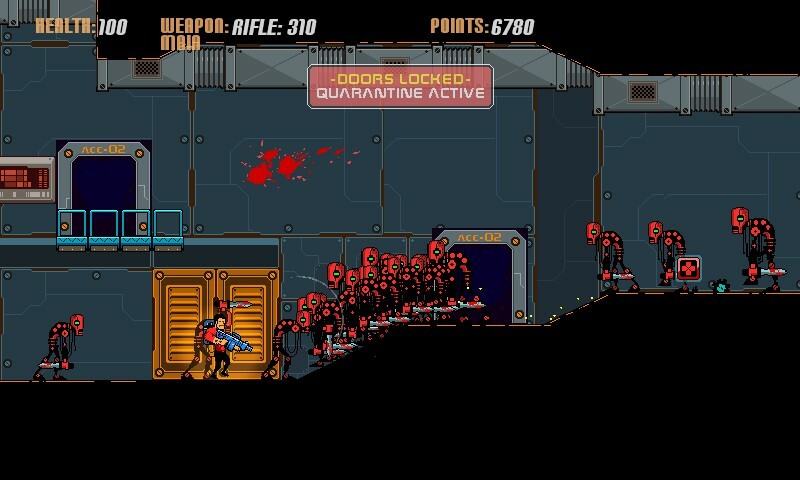 Honestly, I hesitate to think what Contra would have been like if the programmers would have been able to get away with flooding the screen with a few hundred enemies at a time. The Konami code would have had to give you 300 lives. The specific art style didn’t make much of an impression on me. It isn’t bad by any means, but I usually look for something with a little more personality. This can come off as a shade generic at times, though the interspersed cutscenes heap a little more detail and comic-book style artwork in your direction. If you want to make an old-school game, you can’t go wrong with a nice side-scrolling action shooter. I mentioned Contra earlier, and there are certainly elements of it here, though it doesn’t steal wholesale so much as borrow and evolve the basic concepts. For one thing, rather than the single weapon Contra lets you fight with, this game gives you three: a melee weapon, a standard weapon, and a special weapon. 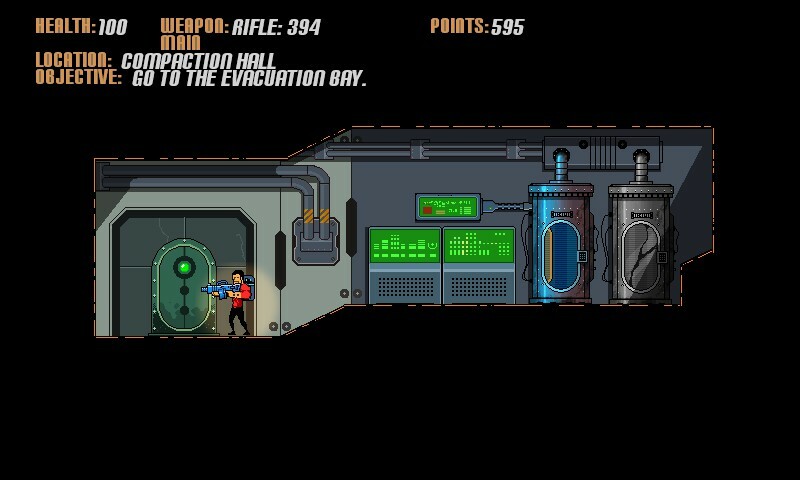 Each of the weapons is gradually upgraded as you fight your way through the ship. With the exception of the melee weapon, everything has limited ammunition, so it isn’t just a matter of finding a gun you like and sticking with it, you need to ration your bullets intelligently, and carefully weigh the strengths and weaknesses of each secondary weapon against the challenges you are likely to face. There were times when I decided to drop the powerful but limited cannon in favor of the far more abundant shotgun, only to run into a situation where three well placed explosive shots would have done the work of literally hundreds of shotgun rounds. 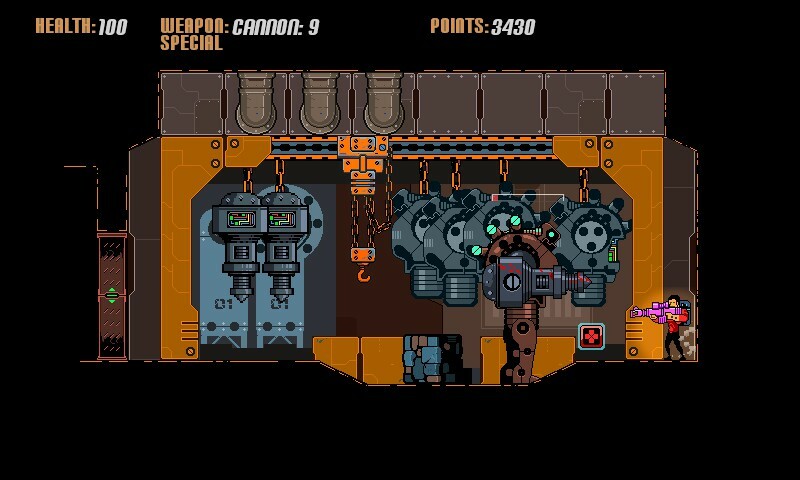 It was also useful that once you get below a certain threshold, enemies start to drop ammo for your primary weapon, so you are never expected to hack through three hundred murderous robots with an ax. I question the need for one of these on a spaceship. The term “metroidvania” is thrown around a lot these days, often for games that don’t really match the formula. I was tempted to compare this game to that genre, but basically the only Metroid element it has is a map that you have to backtrack across sometimes, and save rooms that refill your health. The game world is actually a bit small, but since your objectives take you from one side to the other and back again, you quickly develop an appreciation for the complexity of the ship that is your battleground. It is worth noting that enemies do not respawn, which aside from keeping the limited secondary ammo from being devastating, keeps backtracking quick and easy, rather than feeling like pure padding. However, without said padding, the game is a bit short. On normal difficulty I was able to blow through it in about two hours. Replay value comes in the form of various rush modes, though, which should keep high score hunters coming back, and there are some challenges for those looking for a little something extra, too. While I overall enjoyed the game, there were two things about it that frequently frustrated me. First, the controls. The game was built with both controller and mouse and keyboard in mind. For the mouse and keyboard, the good old wasd moves you around and the mouse aims and fires. It works rather well, but if you are like me, you want to play old-school games in the old-school way. Once you put a controller in your hands, one analog aims, shoulder buttons fire, and the other analog moves you around. Sounds good, except for one little thing. To jump, you press up. For some reason, I could not do so with any degree of accuracy. 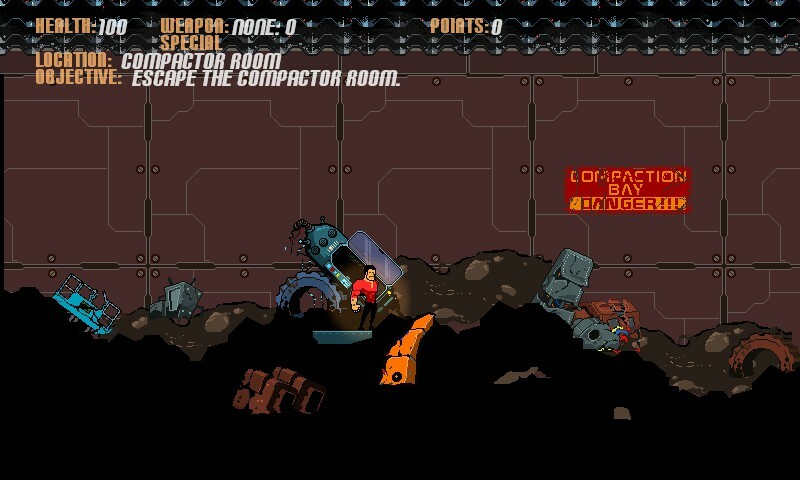 One part of the game which has you scaling the staggered walls of a trash compactor was beyond irritating as a result. The other issue, small though it was, was the way certain types of damage would cause a short pain animation, which could then be chained by further attacks into an almost inescapable seizure of pain. Little zappy robots that take one bullet to kill would gang up on me and lock me in an infinite zap until my frantic up-pushing finally allowed me to jump out of it. And since some of the most enjoyable parts of the game were the “quarantine” rooms that throw waves of enemies at you, it was a real killjoy. I don't know what's worse, their thirst for blood or their posture. What can I say. Look at those visuals. You can probably hear the music in your head already. They did a good job capturing the feel of the game type, as well as the isolated-sci-fi-horror setting. If you were expecting to read more about the sound of a game, you obviously haven’t read any of my other reviews. A long time ago, in a galaxy far, far... no, wait. It's this galaxy. The story in games of this type tends not to be central, but a bit more care went into this one than many. You work on a once great warship that has been converted into a garbage hauler. After awaking to find you have been placed in the trash compactor, you escape with the help of an AI named Mother. (When my friends read this they are going have some comments, I’m sure. Because of this.) 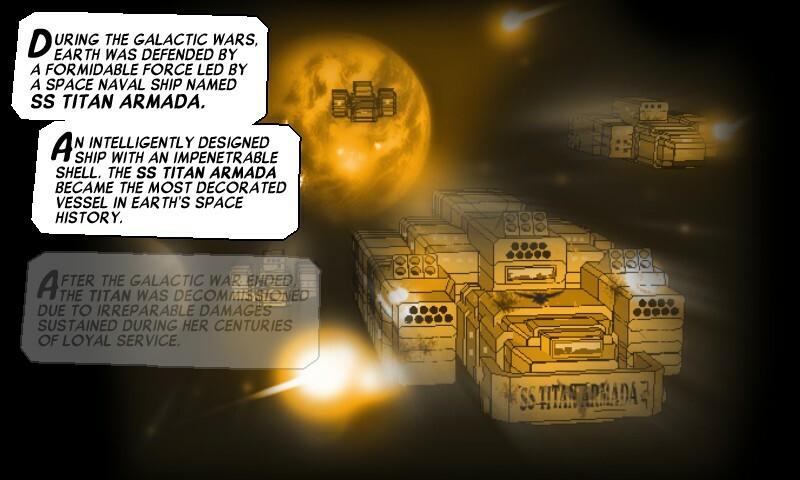 You learn that the ship has been more or less cleared out by a swarm of murderous robots. There are twists and turns, and the crucial bits are told via the aforementioned comic book-style pages. Not worthy of any dramatic prizes, but a nice little addition from a game where having no story at all would have been permissible. 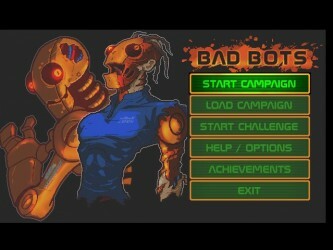 Bad Bots is a game for people who grew up with similar games. To that end it does a decent job. There are a few snags and rough edges, but overall it is an enjoyable way to spend a few hours. 7.8 / 10: With the exception of some minor gameplay quirks, Bad Bots is a solid action platformer for children of the 8-bit and 16-bit era. A long time ago, in a galaxy far, far… no, wait. It’s this galaxy.